This is a slat wall braced shelf. The braced design of slatwall shelf greatly improves stability and makes this shelf great for displaying heavier items. The unibody design also increases the stability of this shelf. 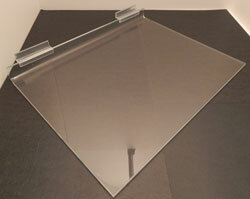 The clear acrylic design will blend in seamlessly with your current retail space. The flame polished edges provide a smooth and clean finish. These braced shelves are ideal for heavy loads. You'll appreciate the acrylic lip as well, giving your merchandise extra stability. Choose from the size options below. 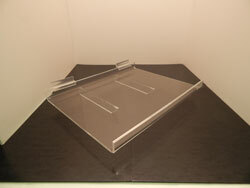 These slatwall shelves are constructed of heavy duty, clear acrylic. Shelves are flat surfaced with no front lip. Choose from the size options below. These extended length, narrow depth, slatwall shelves are best suited for smaller, lightweight items. They are constructed of clear acrylic. Choose from the size options below.